My Office Is Always Open! Don’t wait when you’re ill.
You can contact me or make an appointment to see me 24 hours a day, 365 days a year. My office is in Skokie near Chicago, Illinois. See Dr. Levy on "Living Healthy Chicago"
Nov. 17, 2013 View video of Dr. Levy's appearance on Living Healthy Chicago. It's a locally produced WGN television show on WGN's CLTV cable station. May 11, 2013 - Dr. Levy featured speaker Dr. Mark Levy spoke at Sheridan Shore Yacht Club in Wilmette, at Dr. Deb Carlin's "Build the Strength Within – Wholistic Health" event. 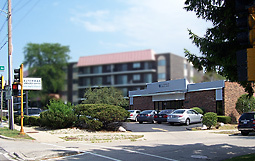 My current office opened at 4959 Golf Road, Skokie Illinois. We improved parking and patient access. © 2012 - 2019 Mark Levy and it's licensors. All rights reserved.